Krishna Engineering Works have been manufacturing and exporting Slat Expander Roll from last 25 years in India. All our slat expander rolls available in different diameters with premium quality and suitable for slow speed machines. 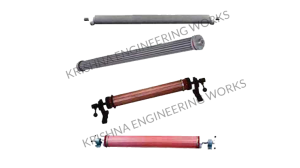 Slat Expander Roll with industry specific requirement and for different machines. In this, 3:1 (lead-in: lead-out) ratio is considered to be the perfect. The best results are attained when Slat Expander Roll is perpendicular to the web direction.